The study says some sort of migration did indeed take place into India and that the Indus Valley civilisation is key to all South Asian populations. A new paper authored by 92 scientists from around the globe that was posted online this weekend could settle some major questions about the subcontinent’s history and what that means for various theories of Indian civilisation. The paper, titled “The Genomic Formation of South and Central Asia” which still has to go through peer review, uses genetics to examine the ancestry of ancient inhabitants of the subcontinent. Below is a quick summary of what you need to know. There are 92 named authors on the study including scholars from Harvard, MIT, the Russian Academy of Science, the Birbal Sahni Institute of Paleosciences in Lucknow, the Deccan College, the Max Planck Institute, the Institute for Archaeological Research in Uzbekistan and the Centre for Cellular and Molecular Biology, Hyderabad. Among the co-directors of the study is geneticist David Reich, whose new book has inspired much recent discussion about ancient human history and racial theory. The researchers looked at genome-wide data from 612 ancient individuals, meaning DNA samples of people that lived millennia ago. These included samples from eastern Iran, an area called Turan that now covers Uzbekistan, Turkmenistan and Tajikistan, Kazakhstan and South Asia. Of the 612, the DNA of 362 ancient individuals was being examined for the first time. They then compared this data with that taken from present-day individuals, including 246 distinct groups in South Asia. A lack of sufficient ancient DNA as well as proper inquiry into the matter has meant that we still do not understand how Central and South Asian populations were formed. 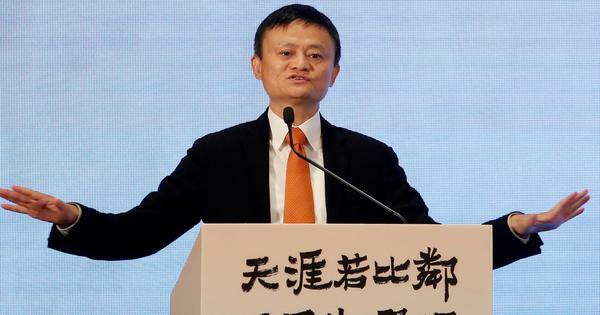 There have been various theories about this, with some very closely connected to politics both in South Asia and abroad. The Nazis, for example, helped propagate the Aryan Invasion Theory in which blue-eyed fair people swept into the Indian subcontinent on horses, conquering everyone they saw along the way. 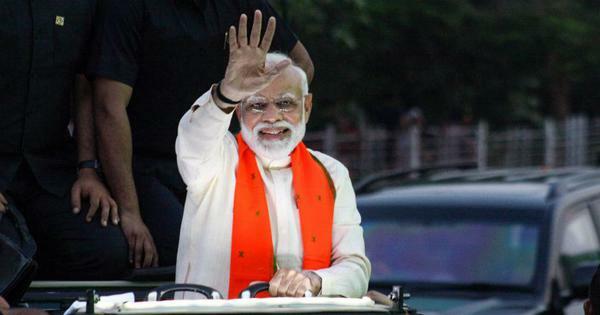 Hindutva proponents have argued the opposite altogether, what is known as the Out-of-India theory, claiming that, if anything, Indo-European languages originated in India and spread out westward from there. DNA and other human science based research has thrown up confusing signals in the past, with mitochondrial DNA, which is only transferred by females being mostly unique to the subcontinent. This suggested that the inhabitants of India have been indigenous for thousands of years. 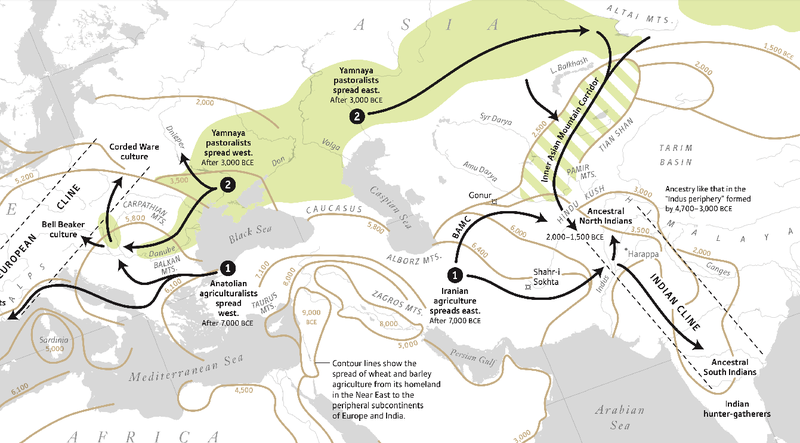 However, Y chromosomes, which are passed from male to male, showed much more connection to West Eurasians, whether Europeans, people of the Irani plateau or Central Asians. Amid all this, there is the question of whom the Indus Valley people were. Were they more connected to those we now know as Dravidians, only to be pushed south by migrating Aryans? Or were they themselves Aryans, who eventually moved southward? 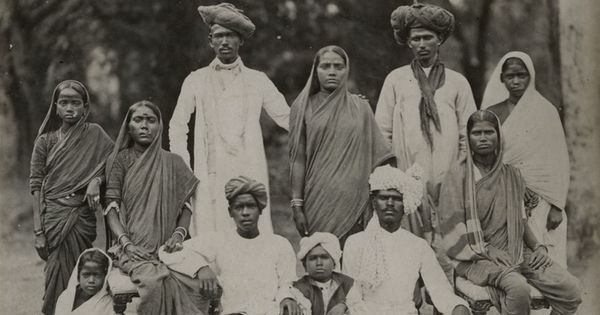 In many ways, the study set out to resolve this contradiction and answer some part of the question: Who are the people of the subcontinent and how did they get there? The paper, which you can read in full here, builds on the genetic understanding that there were two separate groups in ancient India: Ancestral North Indians and Ancestral South Indians, or ANI and ASI. These two groups were, as Reich explains in his new book, “as different from each other as Europeans and East Asians are today.” But where do these two populations, which solidify in around 2000 BCE, come from? There are three potential groupings that, when mixed in various combinations, could be responsible for the creation of the Ancestral North Indian and Ancestral South Indian Populations. The first are South Asian hunter-gatherers, described in this study as Ancient Ancestral South Indians or AASI, the oldest people of the subcontinent, related to modern-day Andaman islanders. Then there are Iranian agriculturists, who were known to have come to the subcontinent, possibly bringing certain forms of cultivation of wheat and barley with them. There is another, important population with South Asian connections that sits somewhere amidst these three: the Indus Valley population. In Turan, the area north of modern-day Iran also known as the Bactria-Margiana Archaeological Complex, there was a huge community of ancient people who seem to have little genetic connection with the inhabitants of the subcontinent. Yet the authors found three individuals from this ancient complex that did have some connection to India, specifically an ancestry mix of Iranian agriculturists and South Asian hunter-gatherers or Ancient Ancestral South Indians. This matched individuals from the Swat Valley in Pakistan, another Indus Valley site. Because the researchers didn’t have direct access to ancient DNA from India’s Indus Valley sites, the paper prefers to call them Indus Valley periphery individuals. These three individuals are key to the findings. Where does the Indus Valley fit in? The reason the researchers call them Indus Valley periphery individuals is because they cannot be sure that their genetic makeup is the same as most of those who lived in the Indus Valley, because they did not have access to ancient DNA from Indian sites. But for the most part they seem to use these individuals as proxies for the people of that civilisation. The make-up of Indus Valley periphery individuals is straightforward: a mixture of Iranian agriculturists and the South Asian hunter-gatherers, or Ancient Ancestral South Indians. The study finds that these two ancestries are also there in both of the subsequent populations, of Ancestral North Indians and Ancestral South Indians, except for a couple of key differences. First Ancestral South Indians have the same basic mix: South Asian hunter-gatherers and Iranian agriculturists, with a higher amount of the former. And second, importantly, Ancestral North Indians have one more ancestry mixed in that is not to be found in Ancestral South Indians: the Steppe pastoralists or, to use the old term, Aryans. In simple terms, the mixing of Iranian agriculturists and South Asian hunter-gatherers first created the Indus Valley population. Then around the 2nd millennium BCE, Steppe pastoralists moved south towards the subcontinent encountering the Indus Valley population in a manner that was likely to have caused some amount of upheaval. Meanwhile, in the north, the Steppe pastoralists are mixing with the Indus Valley population to create the Ancestral North Indian grouping. Most subsequent South Asian populations are then a result of further mixing between Ancestral North Indians and Ancestral South Indians. 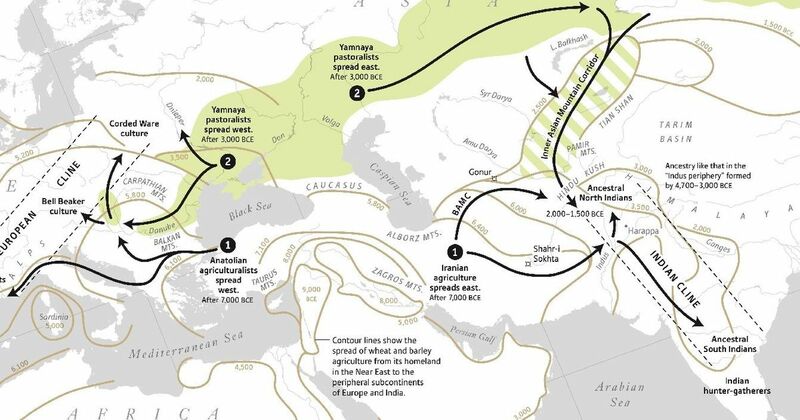 Some form of “Aryan” migration did take place, even if that term is not used. The introduction of Steppe pastoralists into the subcontinent might have been the way what we know as Indo-European language and culture spread, since it was the same lot of Steppe peoples that also moved West into Europe. Moreover, there may be connection between the Steppe migration and priestly caste and culture. The researchers say they found 10 out of 140 Indian groups with a higher amount of Steppe ancestry compared to Indus Valley ancestry. These two were titled “Brahmin_Tiwari” and “Brahmin_UP”. More generally groups of priestly status seem to have higher Steppe ancestry, suggesting those with this mixture may have had a central role in spreading Vedic culture. The Out of India theory is now even more unlikely, at least at the genetic level. The researchers say early Iranian agriculturists did not have any significant mixture of South Asian hunter-gatherer ancestry, “and thus the patterns we observe are driven by gene flow into South Asia and not the reverse”. That said, there is some evidence of movement of the Indus Valley people out towards the Turan area, based on data from the Bactria-Margiana Archaeological Complex. Ancestries of people there suggest some very small amount of South Asian hunter-gatherer mixture, and the presence of the three outlier individuals is believed to possibly be proof of Indus Valley inhabitants migrating to Turan. The Indus Valley Civilisation ancient DNA data from the Haryana site of Rakhigarhi, which was supposed to be released last month, should add to this picture of the ancestry of South Asian populations. For further reading, see these two pieces by Razib Khan and the aforementioned analysis by Tony Joseph.